I’m big on calculation, stats, and statements. I believe you need to know the costs associated with making your business work. Profit & Loss statements or P&L statements are of utmost importance in the trucking industry because of the extremely variable nature of our business. Diesel is a big expense and the cost varies. 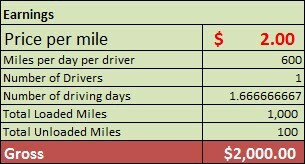 IFTA is based on miles calculation and state fuel tax rates. Putting on miles means increasing exposure to insurance claims and other operating hazards. In addition to all of this, the trucking business is affected by the general state of the U.S. economy. In this post I want to show you what you need to build your very own Profit & Loss statement. This can be done in Excel or if you don’t have Excel you can also do the same thing for free at https://docs.google.com/spreadsheets/u/0/ if you have a Google account. 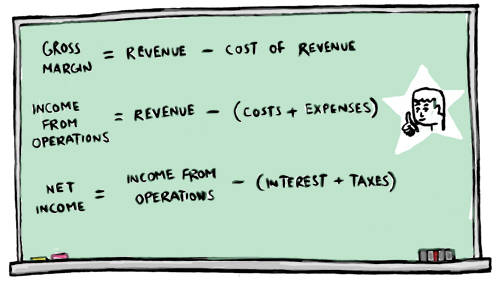 One thing a P&L statement helps me with is in helping me see our fixed and variable expenses. Having spoken to truckers, I often realize that they don’t know the true cost of operating their rig. When you know the cost and you’re accounting for variables like diesel cost and maintenance, you can have a better idea of where you stand when a broker gives you a rate. For this example I’ve changed some of the numbers in the expenses section and am basing all of the numbers on a simple example of 1,000 miles for $2,000. Build an earnings section like this. Now build an expense section like this. Some of the sections like tires, preventative maintenance, and repairs are in a different section which is broken into twelve months and is found in the maintenance account cell. The Worker’s Comp figures are calculated from data in another tab. As you can see from the “Totals” section, Green cells are fixed costs and Yellow cells are variable. 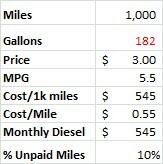 You can build yourself a nifty little fuel efficiency calculator which also helps you account for your deadhead miles. If you have a driver this gives you the empty miles for which you can pay them a different rate. Now that you know your income and expense, you can calculate how much money you’re profiting or losing on a specific load, on a daily basis, or monthly. 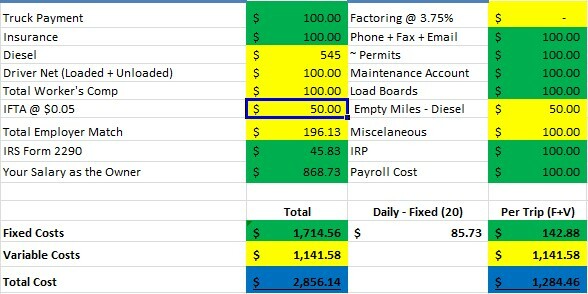 This spreadsheet will now help you know your operating costs better. You can build a trip calculator from these figures which will help you make better decisions when speaking with brokers and placing bids.